If you’re looking for the classic writing instrument par excellence, stop right here. 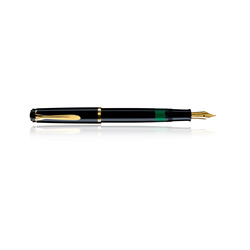 The fountain pen Classic black has a timeless design with its barrel and cap in polished black. It is made of high-quality resin. The 24 carat gold-plated decorative rings and the characteristic Pelikan beak clip underline its traditional design, with a transparent-green ink viewing window as a classy and colorful accent. The Classic black is equipped with a traditional and reliable piston-filling mechanism.